Southwest Pocket Knife - Blue | BUDK.com - Knives & Swords At The Lowest Prices! 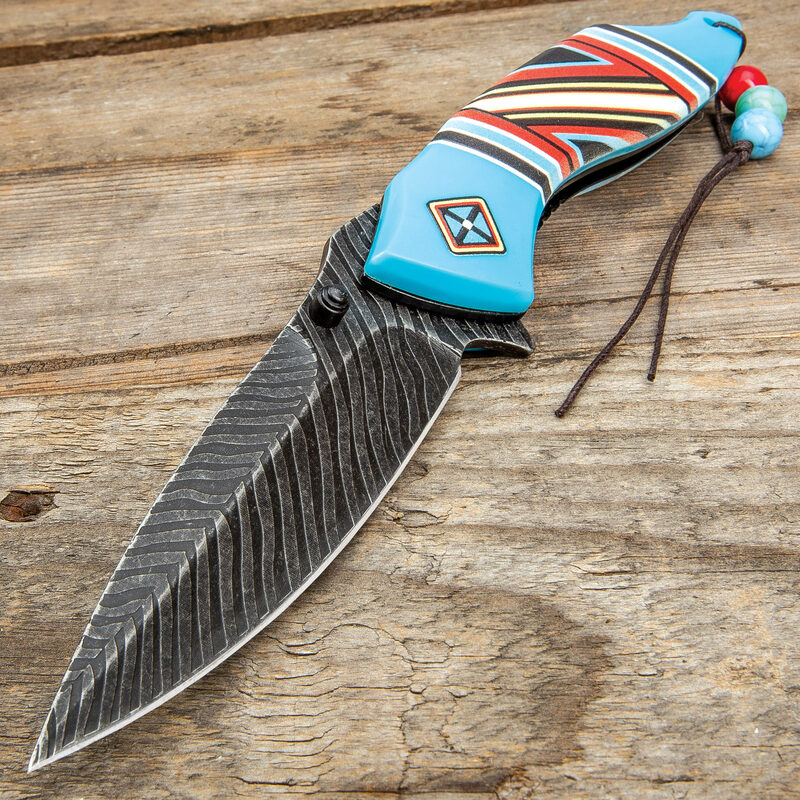 The Southwest Pocket Knife is a fantastic tribute to Native American heritage that is worthy of the true knife aficionado’s collection. 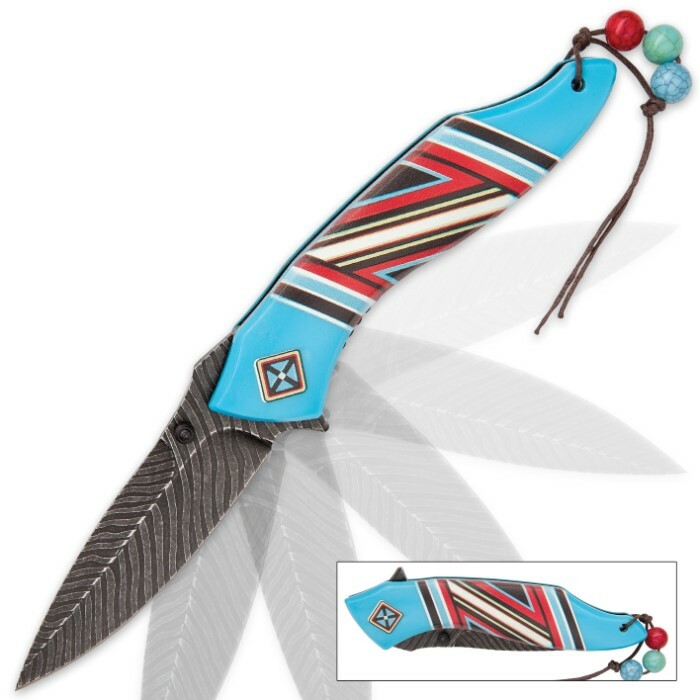 It features a 3 1/2" feather-shaped and textured stainless steel blade with a black finish. 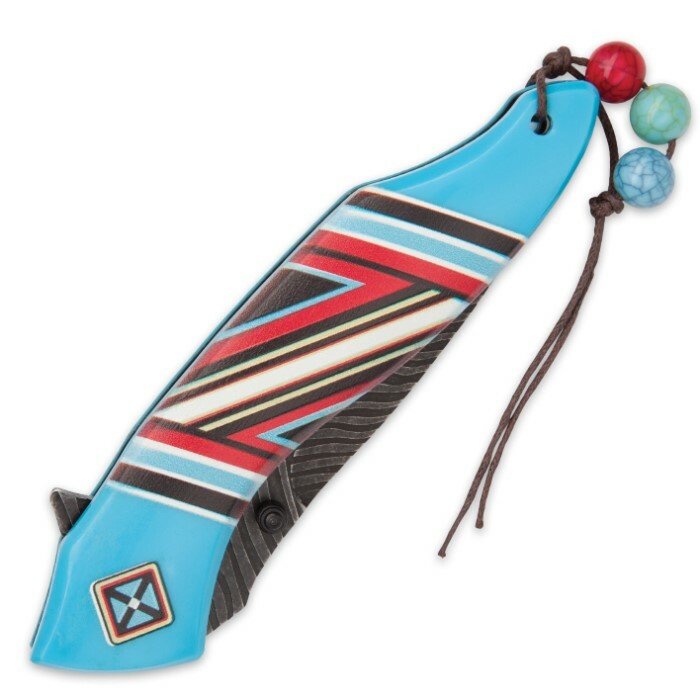 The blue nylon fiber handle features a colorful geometric pattern that looks like it could be found on a traditional Indian blanket. To complete the overall Southwest look, it comes with a leather and bead lanyard. It is assisted opening for ease of deployment. This is truly a beautiful pocket knife you have to add to your Western knives collection. The only downside to this knife is no clip. With that said this is a good knife and I payed very little for it. Fits well in the hand, has a decent handle weight, flipper works well and blade stays decently sharp. I bought the blue turquoise one. Quite an attractive piece. Another in the series of southwestern look knives. This one is good looking,priced right,and feels good in your hand. Exceptionally nice knife. I'm over 50 years old, country, etc. I have a lot of knives. These have the sweetest smoothest opening action knives I've seen short of a well worn antique German made switchblade. And overall, just a really good quality knife, super especially at this price. Both mine came with usable sharp blades ( yeah, yeah "everything can be sharpened better". I don't shave with knives, I shave with razors. Usually electric.). And with these color schemes, they should be easy to find if you drop it in the woods. I got this one and the red. Forget the thumb stud on the top of the blade, it works well and everything, but the "bump button" on the back of these are just fantastic. A little slide or push on that wart and the blade just cruises open. And not loudly. Evil slick not silent. Steel is really good knife good and the entire knife is just very well made Grab a few. Wish I had enough spare money for a case or more. Mine are for me, but these should easily resell for twice the price. P.S. - I immediately cut the beads off mine, but that's my option and opinion. I don't like that string so close to grabbing the blade tip. Also it's single edged with a very false edge, not double edged.